Shannon Lush is an Australian fine arts restorer (and domestic goddess) and I am besotted with her book (co-written with Jennifer Fleming), Completely Spotless, published by ABC Books. It's a gorgeous, hefty tome with a beautiful retro design, full of hints and tips for cleaning your home. My friend Carmen owns this book and I almost smuggled it home after our playdate and have thought about texting her several times over the weekend to look things up for me. Was it the vinegar or the methylated spirits that works best for mirrors? I love that Shannon includes all sorts of cleaning tools in her book (including some major cleaning brands), but still insists that the more natural products bicarbonate of soda and white vinegar can't be beaten. There's a solid recommendation, if ever there was one! (and one our Nannas already knew). 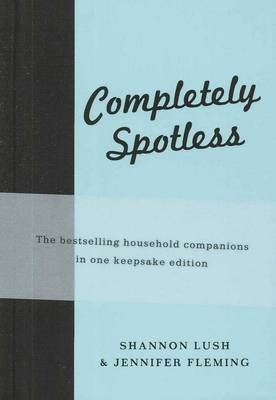 Shannon has several other books available, but it's the packaging of Complately Spotless (and the combination of the two books Spotless and Spotless 2) that wins me over. It's all about the fabric covering in eggshell blue, the great cover typography, and the entirely no-images black and white pages within. Oh yes, and the fabulous no-nonsense advice inside. I'm sure it will be my version of Stephanie Alexander's The Cook's Companion, for cleaning. You can find Completely Spotless on Fishpond and Book Depository. Do you have Shannon and Jennifer's book? Has it been helpful for you? I'm a HUGE Shannon Lush fan - I have all her books except for Spotless 2 but after seeing the gorgeous edition you've posted about above at the bookshop recently, I think I might have to invest in this one also. I just adore it's cover! I find these books really helpful. Back when i was teaching, I got some whiteboard marker on one of my favourite skirts and nothing i did would wash it out. Shannon's book came to the rescue suggesting to put on old milk that had gone curdly to 'soak up' the stain - would you believe, it worked and the stain came out completely!! Amanda - I read about the rotten milk technique just today! It was to get biro off a plastic baby doll. Who would have thought. I'm so glad you have had great use from your books; how cute is this one! Love a book that is useful and looks good too.